Keep up to date with what Porsche have been doing by reading through the latest Porsche Press releases. The Press Releases below have been reproduced from the main Porsche AG website for your convenience. Simply click on Press Release heading to read the details. You can also find Press Releases from earlier years from the archive menu to the left. Stuttgart. The Porsche Team has achieved its maiden win with the Porsche 919 Hybrid in the final race of the 2014 FIA World Endurance Championship in Sao Paulo with the driving trio of Romain Dumas (France), Neel Jani (Switzerland) and Marc Lieb (Germany). At the same time as the team achieved the biggest success of its debut season, it had its deepest shock when Mark Webber had a very heavy accident in the sister car with less than half an hour to go before the end of the six-hour race. The Australian, who shares the Le Mans Prototype with Timo Bernhard (Germany) and Brendon Hartley (New Zealand), crashed heavily into the barriers at the fast last turn of the lap. He was in sixth position. The initial information the team received from the medical centre at the track was that he was not badly injured. However, he has been transferred to a hospital in Sao Paul for further checks. The race finished behind the safety car with Neel Jani at the wheel of the winning car. Lieb started from second, but lost one place to a Toyota on lap one. After breath-taking attempts to get the position back, after 37 laps he handed over the car, which was still lying in third, to Jani. The Swiss continued to attack the Toyota, they swopped places, but when Jani handed over to Dumas after 76 laps the car was still third. Dumas only got by when the Toyota had contact with another car on lap 88. On lap 105 Dumas had to pit early because of a right rear puncture. Lieb got behind the wheel again and took the lead after 119 laps when the sister car suffered problems. Lieb pitted after 144 laps to hand the car back to Dumas. After 183 laps Jani took over with the car lying second. At his final pit stop after 222 laps he stayed in the car and took the risk not to change tyres to save time. The risk paid off. Fritz Enzinger, Vice President LMP1: "The most important news of today is that, given the circumstances, Mark Webber is in good condition, according to the first information from the doctors. I find it hard to believe that we really managed to win our first race in our first WEC season, especially as our joy is overshadowed by Mark's accident. This weekend we have been fastest in every session and had both cars on the front row. The race was a thriller until the very last lap. After three tough years we have achieved this win with a great team in our debut season. Congratulations to the team I'm very proud of them." Andreas Seidl, Team Principal: "According to our information Mark seems to be okay after this heavy accident. This weekend all drivers, mechanics and engineers have completed the last step we had on the agenda for this year: winning a race on our own merit. We were able to show what we have learnt in our debut season. Be it in terms of tyre management, pit stops or other operational aspects our team was top in every regard. Many thanks to everyone who contributed here on track or back home in Weissach. Our 2014 mission is over, and now we are looking forward to the next season." Romain Dumas (36, France): "It is great we have won that race for Porsche, but, of course, it was a lot more important to know that Mark was okay. My first stint today ended early due to a right rear puncture. I don't know what caused it, but maybe some debris. When I was back in the car later in the race I had a much better time. The grip level of the track had improved and we had changed the tyre pressure in the rear. The car was really good. Neel Jani (30, Switzerland): "This was a tough race every lap in qualifying mode and good battles with the number 8 Toyota. That it worked out in the end is almost unbelievable. Together with Romain and Marc we achieved the first pole position for the 919 Hybrid and now the first win. To me this was a dream season. The next dream would be to win the World Championship and to take Le Mans. We hope this is what the future brings. We are now even third in the drivers' championship who would have believed that? Marc Lieb (34, Germany): "What a day for our team! On lap one I lost one position to a Toyota, he surprised me with boosting in a corner, as I wasn't expecting it. Afterwards it was impossible for me to get past him, although I had the faster car. I tried everything but he was all over the place. The second time in the car my biggest problem was tyre pick-up in traffic as soon as I had to leave the racing line. It was like driving on ice." Timo Bernhard (33, Germany): "I had a very straight forward first stint with leading the race from the start until our first pit stop. I handed over the car to Mark Webber with a 12 second lead. Managing the traffic was really challenging, especially towards the end of my stint when I had some bad luck with slower cars. The heat was also really tough. My second stint later in the race wasn't as satisfying, because by then our car didn't have its full power anymore. However, this isn't important anymore. All what counts is that Mark is okay." Brendon Hartley (25, New Zealand): "This was an emotional rollercoaster with the most important news being that Mark is alright. The beginning of my first stint was great when I was leading the race. Timo and Mark had done a great job to bring our car to where it was and it felt fantastic. Then, about ten laps into my stint unfortunately we lost some engine power. We could not defend our position and dropped back. But at least we could have finished the race and it was great to drive on this track. However, this is overshadowed after Mark's accident." Stuttgart. Porsche is sending its second generation of the 911 Carrera GTS to the starting line. Four models, a coupe and a cabriolet, each with rear-wheel or all wheel drive now close the gap between the 911 Carrera S and the street-legal sports car optimised for the race track, the 911 GT3. Some of the technical ingredients that generate even more driving dynamics and driving fun: 430 hp (316 kW) power, the Sport Chrono package and the PASM active damper system which lowers the car's ride height by ten millimetres. Improved efficiency has also led to quicker accelerations and higher top speeds, but combined fuel consumption figures remain unchanged at the favourable level of the S models. When combined with the Porsche Doppelkupplungsgetriebe (PDK), the 911 Carrera GTS sprints from zero to 100 km/h in 4.0 seconds (Cabriolet: 4.2 seconds). The top speed of each GTS model is beyond the 300 km/h barrier; the fastest at 306 km/h is the Coupe with a manual transmission and rear-wheel drive. When adjusted for their additional features, the new top models are attractive in price as well. A number of options are included as standard, such as bi-xenon headlights with the Porsche Dynamic Light System (PDLS) and the sport exhaust system for unmistakable GTS sound. The driver and front passenger also sit in an exclusive Alcantara interior with leather-trimmed sport seats whose centre panels are made of Alcantara as on the other GTS models by Porsche. The exteriors of the new 911 cars like all GTS models by Porsche differ significantly from the other Carrera models. 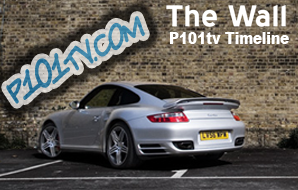 All models have the 911 Carrera 4 body with wide-flared rear wheel arches and a wide track. Also standard are 20-inch wheels with centre wheel locks, which are painted in an exclusive matt black. Accentuating the front end are special trim elements and smoked bi-xenon headlights. Black trim strips on the customised GTS air intake screen and black chrome-plated exhaust tailpipes characterise the rear of the GTS. With the addition of these new top models, the 911 Carrera range now consists of twelve sports cars at three power levels, as coupes and cabriolets, and with rear-wheel and all-wheel drive systems. The 911 Carrera GTS and 911 Carrera 4 GTS will be offered in Germany at prices starting at 117,549 euros, including country-specific features and 19 per cent VAT. In Germany, the four models will be available at dealers starting in November 2014. Stuttgart. With five championship titles, Porsche is the most successful manufacturer in the inaugural season of the Tudor United SportsCar Championship. The race series contested in the USA and Canada wrapped up the season with an enthralling finale last weekend at the Petit Le Mans the ten-hour classic on the storied Road Atlanta race track as well as with a double victory for the Falken Tire customer squad and the Porsche 911 RSR fielded by the Porsche North America works team. This success against tough opposition in the fiercely-contested GTLM class handed Porsche the manufacturers' title. In the GTD class as well, Porsche netted the manufacturers' trophy with customer teams fielding the new Porsche 911 GT America, a race car developed specifically for this series. The Petit Le Mans marked the fourth and final race of the North American Endurance Cup, which consists of the long distance races on the Tudor United SportsCar Championship calendar the 24 Hours at Daytona, the Sebring 12 Hours, the six-hour race at Watkins Glen and, of course, Petit Le Mans. Porsche North America's victory at Daytona with Nick Tandy/Richard Lietz/Patrick Pilet and at Sebring with Michael Christensen/Patrick Long/Jorg Bergmeister as well as the second straight win for the Falken Tire team with Wolf Henzler/Bryan Sellers/Marco Holzer at Road Atlanta earned Porsche three titles in this special endurance championship within the Tudor United SportsCar Championship: Factory pilots Michael Christensen and Patrick Long won the drivers' classification in the GTLM class, with the team title going to Porsche North America and the manufacturers' trophy to Porsche. Winning these accolades in the Tudor United SportsCar Championship not only underscores the success of Porsche's strategy not to focus solely on top-level competition, but at the same time to continue developing customer sport. "Customer racing is a vital part of the Porsche brand's sporting success," says Wolfgang Hatz, Board Member for Research and Development. The importance of strong customer squads, says Porsche's Head of Motorsport Dr. Frank Walliser, has again been emphasised in the Tudor United SportsCar Championship most notably in the GTLM class: "This was an extremely competitive championship with five successful marques competing. Heading to the final round, two manufacturers were tied for the lead, with eleven different drivers posting pole position from the eleven races. You don't see this in any other race series anywhere, not even in Formula 1." Porsche not only supplies its customer teams with its Weissach-developed GT racers such as the 470 hp Porsche 911 RSR the Le Mans-winning car from 2013 based on the seventh generation of the iconic 911 sports car. Porsche also provides its customer outfits with reinforcement by contributing works drivers. Falken Tire is a prime example of this successful driver transfer. For many years the Americans have been able to rely on Wolf Henzler. As one of the most experienced GT pilots at Porsche, the German has made a significant contribution to the ongoing development of the Falken Tire squad to become a top-notch team. Marco Holzer, another works driver, sat in the winning customer nine-eleven with the starting number 17 at Petit Le Mans. For Wolfgang Hatz, the fact that the best factory car had to settle for second place at Road Atlanta does not contradict this strategy. "When we compete alongside our customers, it is entirely possible that we don't have our nose in front," says the Porsche board member. "Our customers belong to our racing family. We are pleased that we can celebrate successes together." Stuttgart. Porsche Exclusive is offering new options for personalising the new Macan*. A Sport Design package, sports exhaust system, bi-xenon headlights and dark-coloured LED rear lights are now available ex-factory. On top of that come the new Sport Classic 21-inch wheel in three colour variants, which draws in its design on the legendary 'Fuchs wheel' of the 911, and new interior offerings. From December these optional extras can also be ordered for retrofitting via Porsche Tequipment. The Sport Design package includes front body, side sill panels, rear bottom section and side blades in a unique look that underlines the dynamics of the Macan. In addition the roof spoiler's trailing edge and the rear mid-section are painted. The Sport Design package is available either completely in the car's exterior colour or with parts in high gloss black. At the core of the sports exhaust system are modified silencers, the performance and sound of which can be altered via a special switch on the centre console. Visually the system is recognisable by two twin tailpipe trims made of stainless steel chrome-plated in black or silver. On the smoked bi-xenon headlights the inner apertures, tubes and painted rims are finished in black. The lights are also equipped as standard with the Porsche Dynamic Light System (PDLS). Matching these there are smoked LED rear lights with dark red lens and surfaces within the fittings finished partially in black. The range of interior features offered by Porsche Exclusive and Tequipment is also being constantly expanded. With the new 'Limed Oak' interior package, for example, overlays are added to the decorative trim on the instrument panel and in the doors. In addition numerous interior elements, including for instance the frame of the Porsche Communication Management system (PCM), can be embellished with leather or high-gloss finishes. Information relating to the Porsche Exclusive and Tequipment products can be accessed online at www.porsche.com. 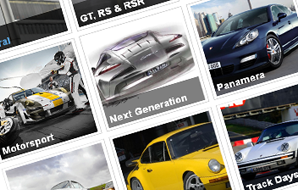 Using the 'Tequipment accessory finder' search function at www.porsche.com/tequipment, you can filter the Porsche accessories range by model. Stuttgart. The Porsche Manthey squad has rearranged the team line-up in its two Porsche 911 RSR for the Sports Car World Endurance Championship WEC. From the next race in Austin/Texas on September 20, Richard Lietz (Austria), winner of this year's Daytona 24 hour race, will join forces with Joerg Bergmeister (Germany) in the number 91 Porsche 911 RSR. Patrick Pilet (France), who had shared driving duties with Joerg Bergmeister until now, will contest the five remaining races on this season's calendar with his compatriot Frederic Makowiecki in the 911 RSR with the starting number 92. He replaces Marco Holzer (Germany), who will now focus totally on his duties as a test and development driver for Porsche. "We reshuffled the driver line-up in the 911 RSR for tactical reasons. This puts us in a very good position for the remaining races of the season and our campaign for the World Endurance Championship title," says Porsche Head of Motorsport Hartmut Kristen. "Marco Holzer is an excellent test driver. He will support us for the rest of the season as a development driver for future factory and customer racing vehicles." Whether Richard Lietz is ready to race in time for the Austin round depends on how well he has recovered from his accident during a practice session at the United SportsCar Championship in Alton/USA just over a week ago. As a precaution, Porsche Team Manthey has also entered Nick Tandy (Great Britain) for Austin as the third driver of the #91 Porsche 911 RSR. Still on the calendar of the Sports Car World Endurance Championship WEC after Austin are the races in Fuji/Japan (12 October), Shanghai/China (2 November), Bahrain/United Arab Emirates (15 November) and Sao Paulo/Brazil (30 November). Stuttgart. Nothing is impossible! Going on holiday with lots of luggage and yet still being able to enjoy sports car motoring at your destination is something that Dr. Ing. h.c. F. Porsche AG makes possible for all of the latest 911 coupe models. How this is achieved was demonstrated recently by the sports car manufacturer, using a 911 Carrera S on the ATC test site in Aldenhoven. The 911 was put through its paces there banked corners included carrying a variety of loads on its roof, among them bicycles and snowboards. Four suitcases for holiday luggage were also on board. Transporting such loads is made possible by a special Porsche Tequipment genuine accessories roof transport system, which quickly transforms the 911 into a vehicle offering a miraculous amount of luggage space. Every Porsche 911 1) is pre-equipped for this ex-factory. The system is designed to carry bicycle racks, a roof box or ski/snowboard racks. The roof box alone provides an extra 310 litres of luggage space, bringing the total available up to 455 litres in all. Up to three bicycles can be transported on the 911's roof, while for winter holidays it can handle no less than six pairs of skis or four snowboards. For all 911, Boxster 2) and Cayman 3) models Porsche also offers six different child seats in the Porsche design. In total over 300 practical optional features for all Porsche models can be found at www.porsche.com/tequipment. The possibilities for retrospective individualisation include performance enhancements, transport and protection systems and extend all the way to Sport Design packages and other handy accessories. Westlake Village/Stuttgart. Porsche continues to remain a popular car brand in the United States. For the tenth year in a row American new car buyers have ranked sports car manufacturer Porsche highest in the latest survey J.D. Power 'APEAL' (Automotive Performance, Execution and Layout) Study. Just last month, Porsche in the U.S. was ranked highest among all nameplates in the 2014 J.D. Power Initial Quality Study. At this year's APEAL vehicle valuation Porsche 911 drives up to the highest rank in the "Midsize Premium Sporty Car" segment. The mid-engine models Boxster and Cayman ranked highest and second in the "Compact Premium Sporty Car" category. The Cayenne for the fourth time in a row is best in its class "Midsize Premium SUV". Furthermore the Panamera gained three places and now ranks third among "Large Premium Cars". The overall ranking is the result of scores in ten different categories including driving dynamics, design, suitability for daily use and vehicle comfort. The current basis for the annual survey is information from more than 86,000 new-car buyers of a total of 239 different models which were registered from November 2013 to February 2014. Stuttgart. Their first appearances at the world's most famous tournament traditionally come not on the green grass but on the red carpet � at the WTA's Pre-Wimbledon Party. As the partner of the prestigious event, Porsche for the first time ensured that the players were driven quickly and safely from their hotels through London's traffic to the Kensington Roof Gardens venue. Superstar Maria Sharapova had the pleasure of not only an exceptional car but also a special chauffeur: the Porsche Brand Ambassador and recent French Open winner was chauffeured by Porsche works driver Mark Webber in a Porsche 918 Spyder, the super sports car with its innovative plug-in hybrid technology. The CO2 emission of the 918 Spyder is so minimal that it is exempted from the London Congestion Charge. When arriving at the red carpet, the exceptional car and its famous occupants both attracted a lot of attention from the waiting fans. "What a fantastic way to arrive at the party," enthused Maria Sharapova. "To be in the fastest Porsche with a racing driver like Mark is amazing. And it's great too to be driving in a city like London running only on electric power, the 918 Spyder is an unbelievable car!" "Having just driven the Porsche 919 Hybrid race car at the Le Mans 24 Hours last weekend, I already know that this technology can produce incredible results," said Mark Webber. "The 918 Spyder is the closest thing to a road-going version, and it's just as amazing especially as it can be driven into London for free. And of course it's great fun to drive Maria around in it!" Other top tennis stars like Serena and Venus Williams, Victoria Azarenka, Eugenie Bouchard, Ana Ivanovic and Andrea Petkovic were all chauffeured to the red carpet in a Porsche Panamera S E-Hybrid. Wimbledon is the third Grand Slam tournament of the year and begins on the grass courts of the All England Lawn Tennis and Croquet Club in the London suburb on coming Monday. Porsche Team Germany's Angelique Kerber, Sabine Lisicki, last year's runner-up, and Andrea Petkovic are all seeded. Stuttgart. Podium placing for Porsche at the 24 Hours of Le Mans: Porsche Manthey squad's 470 hp Porsche 911 RSR driven by works drivers Marco Holzer (Germany), Frederic Makowiecki (France) and Richard Lietz (Austria) took the flag at the 82nd edition of the long distance classic at the Sarthe third in the GTE-Pro class. Scoring second in the GTE-Am class, Porsche junior Klaus Bachler celebrated the greatest success of his career by now at his first ever Le Mans race. The race on the 13.269 kilometre Circuit des 24 Heures kept more than 200,000 spectators on the edge of their seats with enthralling fights for positions and spectacular overtaking manoeuvres. When two heavy rain showers left parts of the track underwater several hours after the start, the squad initiated the perfect pit stop strategy which put the Porsche 911 RSR in positions one-two. However, the winning car from last year, based on the seventh generation of the iconic 911 sports car and double winner of the Sports Car World Championship WEC season-opener, was unable to defend these positions over the rest of the marathon. In addition, during the night a fuel pressure problem cropped up with the 911 RSR driven by works drivers Joerg Bergmeister (Germany), Patrick Pilet (France) and Nick Tandy (Great Britain) which required an extra pit stop and finally threw the trio back to seventh place after their strong performance. Their factory pilot colleagues in the #92 Porsche 911 RSR continued on their podium course. With three hours to the flag, they had moved up the order to lie in second place before losing a position in the dramatic final phase. The podium result was a well-deserved reward for a strong performance under difficult conditions. Klaus Bachler celebrated his GTE-Am class result. Sharing the cockpit of the Proton Competition customer team's 911 RSR with his teammates Christian Ried (Germany) and Khaled Al Qubaisi (Abu Dhabi), the Porsche junior saw the flag at his Le Mans debut in second place. In the 911 RSR campaigned by Dempsey Racing Proton, Porsche factory driver Patrick Long and his American compatriots Patrick Dempsey and Joe Foster delivered consistently fast lap times to finally finish in fifth place. Hartmut Kristen, Head of Porsche motorsport: "Although it was enough for a podium spot, this year's Le Mans was a little disappointing. Minor technical problems cropped up in both our 911 RSR, but as a total they were decisive. The crew and the drivers have done an excellent job and brought the cars safely home. I praise them for this. Congratulations as well to the Proton Competition squad for second place in the GTE-Am class. Given the performance rating, there was no better result possible for us." Olaf Manthey, Team Principal Porsche Team Manthey: "We tackled the race with other expectations, but small technical gremlins can always turn up all the time. That's nothing new for me. I've been doing this for 40 years. Both cars reached the finish line and third place is good. You win some, you lose some. You just have to make it through." Marco Holzer (911 RSR #92): "It was a long and demanding race. We faced all weather conditions you could possibly imagine. At times it was dry, then it poured with rain, half the track was wet and half dry. The car ran like clockwork until we had to pit unexpectedly shortly before the finish. That cost us second place. But the team did a great job and we earned vital points for the WEC." Frederic Makowiecki (911 RSR #92): "Thank you to my pit crew. They were very fast and didn't make one mistake. We constantly tried to push to the max and get everything we could out of the car. I regard this podium spot as a basis for even better results in the second half of the season." Richard Lietz (911 RSR #92): "After scoring first and second last year we were all expecting more. But some of our rivals were bluffing at tests and only displayed their actual race speed here. We tried to keep up and my teammates really went flat out. The podium spot is the just reward for this. I'm certain we'll return next year even stronger." Joerg Bergmeister (911 RSR #91): "That's unfortunately not the result we wanted and were hoping for. We experienced a problem that relegated us back down the order. Other than that the car ran well. A podium result would definitely have been possible. Unfortunately, of all places we had this bad luck here where double points are awarded." Patrick Pilet (911 RSR #91): "Our car was perfectly prepared for the race, but we experienced a problem during the night. Okay, we solved it but it cost us a lot of time. For this reason we couldn't do a thing about the outcome of the race. But still, we can be proud of our team and Porsche. Now we have to concentrate on the rest of the season." Nick Tandy (911 RSR #91): "It wasn't the best race, but with the exception of this one problem the car ran very well. The entire crew did a fantastic job. If the second twelve hours had run as well as the first, we would have achieved a fabulous result." Klaus Bachler (911 RSR #88): "Second place is awesome. A dream has come true for me. We did everything right, kept out of trouble at the start, only refuelled and changed the tyres. That's how we got ahead. Now we're all over the moon." Christian Ried (911 RSR #88): "The race was good, technically everything went smoothly. The car was great and so were the tyres, it simply all worked well. I'm really happy that we scored a podium spot." Patrick Long (911 RSR #77): "We certainly could have done more this year. Still I'm satisfied with our performance as a team. Our car didn't have the slightest technical problem and Patrick improved constantly and posted super times. Not everyone can climb the podium at Le Mans. If it was that easy then everyone would have a Le Mans trophy at home." Patrick Dempsey (911 RSR #77): "I drove really well, didn't make any mistakes and my pace improved constantly. We all did a great job against such tough competition and I'm happy with the result and the team's great performance. I'll definitely be back at Le Mans next year." Round four of the Sports Car World Championship WEC takes place on 20 September in Austin/Texas. Wolfgang Hatz: "This was in 2011. We were and still are well positioned in the GT category, but it is time for the brand to re-enter at the elite level. The options for this are easily understandable. There is Formula 1, and there is the WEC with Le Mans. An essential criteria for the decision was the desire to establish the project at Porsche itself, so the expertise would be developed and remain in-house. The World Endurance Championship including Le Mans suits us best, it is a real team sport. This is especially true of the team of drivers. But we also needed to create the infrastructure for this first: new buildings, a team of 230 people, every other one of which is an engineer." Wolfgang Hatz: "Porsche is part of Le Mans, and Le Mans is part of Porsche. They fit together. Nevertheless, no one makes these kind of investments due to nostalgia; they have to pay off in the future. As far as I can remember, there was never a regulation that gave the engineers so much freedom and required so much innovation. The obligation towards producing a hybrid and the efficiency formula represent revolutionary challenges. I am proud that our engineers ventured the furthest of any. Ultimately, Porsche customers will benefit from this." Can you explain this in laymen's terms? Wolfgang Hatz: "Our combustion engine is the finest and most efficient engine ever developed by Porsche. This compact two litre, four cylinder, turbo engine with direct fuel injection and a performance of over 500 PS drives the rear axle. It is the smallest engine with the least number of cylinders in the top category of the race. Our engineers also combined a fundamentally new exhaust gas energy recovery system with this engine. No one else has that. We store the energy recovered from the otherwise unproductive flow of escaping exhaust gasses in a battery. We store energy, which we generate during braking on the front axle in the same battery. When the driver retrieves energy from this reservoir comprised of the latest type of battery cells, several hundred horsepower drive the front axle. During this phase, the driver has a powerful all-wheel drive at his disposal. Our car is the only one in the field which converts energy that would otherwise simply be wasted and makes it useable, not only when braking, but also when accelerating. This represents an immense potential for future road sports cars." Wolfgang Hatz: "Not at all; the races at Silverstone and Spa-Francorchamps have demonstrated this. The prototypes have plenty of power available; whether this is from the internal combustion engine or electrical does not matter. They must use all of the energy on each lap, otherwise it is a waste. Nothing can be saved here. These endurance races are sprints over incredible distances." Wolfgang Hatz: "It would be terrific, if the GT team could build on the success of the previous year. However, that is literally more difficult because we had to add weight in accordance with the regulations. Porsche Team Manthey headed by Hartmut Kristen has extensive experience, which may make the decisive difference at Le Mans. The situation is completely different in the case of the Porsche team headed by Fritz Enzinger in the LMP1 class: We have no experience there at all. 2014 is a year of learning. Not admitting that would mean miscalculating Le Mans. At Spa-Francorchamps, the Porsche 919 Hybrid impressively demonstrated that the necessary speed is there with pole position and the fastest race lap. Our competitors know we are a force to be reckoned with. However, the 919 Hybrid has not yet covered the complete Le Mans distance in racing conditions. In this respect, it would be a success if one LMP1 finishes the event. Succeeding with both would be fabulous." At Silverstone, we saw you emotionally applauding the podium place in the overall standings in the pouring rain. Isn't that the high demand Porsche imposes on itself? Wolfgang Hatz: "That was a great moment of joy. But I am not losing sight of reality over this. We were not top-notch at Silverstone. We also benefited from the competition's problems. But we did complete the first six-hour race with this extremely complex car and a team that has never competed before at a circuit. All the processes, especially under chaotic weather conditions, worked very well for the debut. And everyone worked extremely hard for this. The drivers showed their enormous skills but also a lot of discipline. The podium was a great experience for all of us. And we had a one-two in the GT class. The picture we saw on Sunday in England was terrific." Wolfgang Hatz: "I will be on duty and will not be a spectator. Of course, I spend most of the time in the pit. I attend every race and was at the tracks for almost all the tests. Mostly, by the way, by the side of Matthias Muller, Chairman of the Executive Board, and that will also be the case on June 14/15. Come, what may." Stuttgart . On June 14th/15th the countdown to Porsche's return to the highest class at the Le Mans 24-Hour race with the 919 Hybrid will be over. The record of 16 overall wins at what is probably the hardest car race in the world remains unbeaten. Nevertheless, Porsche cannot rely on its successful past. The prototype with its two innovative energy recovery systems is completely new territory. However, Le Mans isn't all about technology. Memories like the ten below highlight how hard it is to win this marathon. "After three hours we thought we'd lost the race. My 936 was out, and I joined up with Jurgen Barth and Hurley Haywood. But they were having trouble as well. We were in 42nd place. I still can't get my head around what happened next. It was this euphoric state. I drove the whole night through at top speed, always at the limit. In rain and fog. I just got faster and faster. 42nd, 35th, 28th, 20th, ninth, sixth, fifth. Everyone felt that we could achieve the unimaginable. Jurgen and Hurley drove faster than ever, and the mechanics did an incredible job. I didn't feel tired at all. Then we took the lead. On Sunday morning I was totally spent. In the end, Jurgen hauled the 936 across the line with only five cylinders. I wouldn't have been able to. There are a lot of great stories about a lot of races. But 1977 stands out. That was a once-in-a-lifetime thing. Races like that have made Porsche a legend." "I lost to Jacky Ickx in 1969 after we'd spent the last hour and a half overtaking each other several times each lap. In 1970, Ferdinand Piech ensured that we had a good chance to go for the win with a more powerful engine. Being able to win just a year after losing by a hair's breadth was, of course, very special. It was also the first overall victory for Porsche and it was my last race. I announced my retirement from racing after that. I had promised my wife. She had started to press me a year or two before, because of the many friends we had lost. And I knew it myself: there was no reason I should have all the luck, and at some point my luck might run out. It was very moving that all of these factors came together in 1970. I don't remember if I shed any tears or not. But I certainly could have I'm pretty emotional." "We won under odd circumstances. In February, Helmuth Bott, who was then board member for development, asked me what car I wanted for the 24 Hours of Le Mans. I told him three things: First, I wanted the 4.5-litre 12-cylinder instead of the 5-litre engine, which I thought was less reliable. Second, I wanted the 'Kurzheck' (short-tail) version of the 917 because the long-tail version was so fidgety. Third, I wanted Hans Herrmann as my partner, because he knew how you have to pace yourself with the material to get through the long race. I got everything. And then we qualified in 15th. At that moment I thought I had made the biggest mistake of my life. We wouldn't stand a chance against the 5-litre engines. We weren't competitive and could only hope that the cars in front of us would have problems. And that's exactly what happened." "In 1987 at Le Mans we wanted to enter three cars, as always, and had built a fourth 962 as a spare. It was customary in those days for the drivers to test-drive all the cars in Weissach before traveling to France. Hans-Joachim Stuck damaged one of the cars irreparably in the process. So there were only three. That's what we took to Le Mans. In one of the free practice sessions, Price Cobb had a serious accident with his car. So then there were only two. We started the race with those two cars. After just under an hour, Jochen Mass came into the pit. The engine was kaput. I think a piston burned through. So there was only one. There were still 23 hours to go, almost the entire race, and we had just one iron left in the fire, the 962 of Stuck, Derek Bell, and Al Holbert. The situation was extremely exhausting and exhilarating for me as the race director and the whole team: What would happen with just one car left? It went well. We won." "Sweeping the podium is a great moment. I was cautious going into the race. The 956 was a completely new car. You can't go into every race saying, Hurray, we're going for the win! You have to see how things go getting through 24 hours is no easy task. This win was perfect and actually somewhat surprising. We had taken our job very seriously. A few years before that we had made a mistake. In 1979, Ernst Fuhrmann was still with Porsche and he said to us engineers, 'What do you say if we drive Le Mans this year? There's practically no competition.' Basically, we just had to show up and walk off with the victory. And what happened? We didn't reach the finish line with either car we lost even without competition. You can trip over your own feet as well. Having experienced that, I really enjoyed the win in 1982. The 956 went straight into the museum. It's the car that hangs from the ceiling." "The region of the Sarthe is generally characterised by a slow pace of life. And then once a year the fastest cars in the world come to visit. Speed rules the roost, bringing excitement, noise, and danger. The drivers experience a similar study in contrasts. As the race director, I often woke the drivers for their turns. Those were special moments, and there were big differences. The physically strongest driver was definitely Jochen Mass. He was really never tired and hardly needed any sleep. Jacky Ickx was always immediately present when you woke him. But some could barely handle the demands and had to be shaken out of a deep sleep of exhaustion. They'd only just come to before having to get behind the wheel. And in those days, the cars were incredibly loud. It must have felt like going from the bosom of Abraham into some hellish machine." "It was one of my jobs to look after customer teams, and I was responsible for organisational things like accommodations, food, tickets, and stuff like that. At the same time, I was also a reserve driver, and I always hoped for a chance to drive, like in 1982: Hurley Haywood, who was sharing a 956 with Al Holbert, had to pull out with stomach problems. His stomach was his Achilles' heel. I was notified at around 11 p.m., and hopped right into my racing suit. My colleagues joked that I'd put something in Hurley's food so that I could drive. It was nonsense, of course. In the car, my enthusiasm dimmed somewhat because I couldn't help noticing that Hurley and Al both had narrower hips than I did. My hips only fit in the seat sideways; I was constantly shifting from one side to the other. We came in third. At the start, I had no idea that I would take part. Sunday, I was on the podium." "I drove three times at Le Mans, but 1970 is the year that has stuck in my memory the most. Together with Helmut Marko, we won the prototype and index classes and came in third overall in the Porsche 908. That night it rained cats and dogs. Rain, rain, rain for hours. No one who hasn't experienced that can imagine what that means for a driver at Le Mans. If you want to overtake a car, first you have to dive into the spray. You can't see a thing, you have no idea what's behind the spray: One car? Two? For a while Hans Herrmann and I were driving together at night. That was good, because we knew who we had around us. For Helmut Marko and me, there was also the fact that our car was an open one. At the end of a turn we were soaking wet if not from sweat, than from the rain. I was just 25, a young'un." "My Le Mans moment lasted three minutes and 14.8 seconds. Pole position with the Porsche 962 C, a perfect lap. And because the Mulsanne straight was later defanged through the addition of chicanes, it will likely be a record for posterity. The 962 is the best race car that I ever drove. Brute force and unbelievable ground effects. The centrifugal forces were enormous, and there was no power steering. You needed the strength of a bear and a lot of courage. I just had one run because of the tyres. Start, Dunlop curve, left, right through the Esses. At Tertre Rouge I was pushing the traction limits. But the corner is so important for your speed on the Mulsanne straight, and it was right on. Fifty seconds of flooring it, then brake from 360 km/h for the Mulsanne corner and jump back on the gas as soon as possible. Indianapolis, Arnage, Porsche curves, Maison Blanche, Ford chicane, and you're done. In those three minutes my concentration was sharp as a knife. It was just me and that Porsche at Le Mans." Stuttgart . Following the podium finish at the season's opener in Silverstone, the new Porsche 919 Hybrid came fourth at the second round of the World Endurance Championship (WEC). Drivers Romain Dumas (France), Neel Jani (Switzerland) and Marc Lieb (Germany) had started with the car no. 14 from pole position for the six hour race and was the leading car for a long time. But then incidents cost time. An electric problem required a reset by Dumas while he was driving and on the final laps Jani had an extra pit stop due to a puncture. The race day for the sister car no. 20 of Timo Bernhard (Germany), Brendon Hartley (New Zealand) and Mark Webber (Australia) was even less lucky. They had started fifth, improved immediately to third but then were hampered by technical problems and dropped back to the end of the field. Nevertheless, the newly formed Porsche Team managed to achieve the main target for the weekend which was finishing the race with both LMP1 cars. The speed of the Porsche 919 Hybrid was convincing in Spa. For long periods of the race it was the fastest car on track. The overall fastest lap of the weekend was by Marc Lieb (1:59.887 minutes, free practice two). Neel Jani's fastest qualifying lap (2:00.334 minutes) was the overall second fastest lap of the weekend. Fritz Enzinger, Vice President LMP1: "It was our main target to finish the race with both Porsche 919 Hybrids and this is what we have managed. But after we had achieved pole position and saw very good lap times in the race we certainly hoped for a better result. But due to the technical problems, especially on car no. 20, it wasn't possible today." Alexander Hitzinger, Technical Director LMP1: "In car no. 14 we've had a false alarm which has switched off the hybrid system. Romain then had to do a time consuming reactivation procedure. We are very conservative when it comes to safety of our hybrid systems, so such a thing can happen and there is some homework to do. The Porsche no. 20 had problems with the rear dampers plus two failures of the front drive shaft. We knew this was a critical part and we are prepared to use stronger parts at the next test and in Le Mans. We have been fast in qualifying and in the race and brought both cars home � for us this was the most important target for the weekend." Andreas Seidl, Team Principal LMP1: "The weekend had many positive moments, for example our qualifying performance and lap times in the race. But at the same time it has shown what is still missing here and there. Nevertheless: In the race we were on the same level as the competition. Overall we have learnt a lot. The team has once again done a great job. This was another important next step towards Le Mans." Romain Dumas: "I am happy to have done my very first race stint in the Porsche 919 Hybrid now. Unfortunately we had an electrical issue after I had jumped in and it is a shame it cost a lap. In the end Neel took over again because it was clear we could not do two and a half stints with one set of tyres but maybe one and a half to get away with a splash and dash in the end." Neel Jani: "I knew it would be important for me to defend P1 in the first corner after the start, I was really committed through La Source and then I had to take a bit of a risk in Eau Rouge as well. I gave everything in the first stint and that was how I managed to get a good lead. The second set of tyres somehow was less comfortable but I could stay in the lead. I think in Silverstone we were okay in qualifying but nowhere in the race. Here we were very good in qualifying and could lead the race for a long time. Looks like good progress." Marc Lieb: "I have had a rather quiet stint but nevertheless it wasn't easy. I couldn't really follow the pace of the car in front of me. However, an important lesson learnt today was how to manage a set of tyres to make it last for two stints." Timo Bernhard: "Right at the start I got squeezed a bit in the pack but I could overtake an Audi and a Toyota on lap one to improve from fifth to third. Then suddenly the car felt strange and I pitted straight away. This was after nine laps. We fixed it and I did a 50 lap double stint with one set of tyres which wasn't easy. Unfortunately later we had more problems with our car." Brendon Hartley: "The first few laps from Timo were really good but then we have had a couple of technical issues today. I think the team has managed the repairs very well as the car never spent too much time in the garage." Mark Webber: "Despite the problems we had with our car we never gave up fighting and got the most out of it. The car runs well now but we could not exploit its full potential. The team works really hard and we are learning very quickly. Our speed is encouraging. We now have to solve the teething problems which are normal for such a new project. We knew we would be better here than in Silverstone. There we weren't competitive. But here we were." With two different energy recovery systems the Porsche 919 Hybrid is the most complex race car the sports car manufacturer has ever built, and serves as the fastest mobile research laboratory for future road cars. The lightweight prototype is trimmed for extreme performance and efficiency. Besides the kinetic energy recovery system (MGU-K) under braking, the 919 Hybrid recuperates thermal exhaust energy (MGU-H) when accelerating. The combination of these two systems means a step into unknown territory for Porsche and a unique feature in the entire WEC. When the driver recalls the stored energy from the liquid-cooled lithium-ion battery packs, an electric motor drives the two front wheels. This power adds to the combustion engine (downsizing 2.0 litres V4-cylinder, turbocharged with direct injection) and this way the two systems result in temporary all-wheel drive. Sports prototypes and GT vehicles contest the sports car World Endurance Championship WEC in four classes: LMP1 (eg. Porsche 919 Hybrid), LMP2, LMGTE-Pro (eg. 911 RSR) and LMGTE-Am (eg. 911 RSR and 911 GT3 RSR). They all compete together in one race but are classified separately. From 15th to 18th May the Porsche Museum will be entering an impressive starting field for the 1,000 miles of the legendary Mille Miglia. Competing in the famous long-distance road race will be a 550 Spyder, two 356 Coupes and a 356 Speedster. The drivers of the unique vehicles will include Dr. Wolfgang Porsche, Chairman of the Supervisory Board of Dr. Ing. h.c. F. Porsche AG, Stuttgart, and racing legend Jacky Ickx. For both drivers and vehicles the Mille Miglia is still a challenge today, as the new route of 1,750 kilometres is covered in just four days and leads in the main through differing weather zones. Speedster across the south-west of Germany. The Goodwood 'Festival of Speed' is inconceivable without a Porsche. An annual event since 1993 on the estate of Lord March in West Sussex, it takes place this year from 26th to 29th June. The 'Festival of Speed' is the largest event of its kind anywhere in the world. 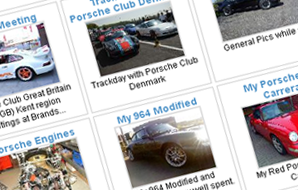 The spectators can look forward to seeing numerous famous classic Porsche cars. The focus this year is on the 'Turbo' theme. The cars to be seen will therefore include a Porsche 959 Group B, a 964 Turbo, a 993 Turbo and a Porsche 935, known as the 'Baby' due to its scaled down 1.4-litre engine. Also awaiting the visitors are two special Porsche 917s: the Porsche 917 KH, which brings back memories of the first overall Porsche victory at Le Mans, and the Porsche 917/30, which was developed for the CanAm race series. Coinciding with Porsche's return to the 24-hour endurance race with the Porsche 919 Hybrid, a number of famous Porsche vehicles will also be appearing at the Le Mans Classic from 4th to 6th July. This summer the Porsche Museum is sending four participants to France - a 911 Carrera RSR Targa Florio, the Porsche 935/77 Group 5 racing car, a 911 Turbo Cabriolet and a 911 Turbo 3.0. From 10th to 12th July, the Porsche Museum will then be lining up several historic legends at the 'Ennstal Classic', where this year Porsche will be the main theme. With a hill prologue, tours through the Tauern Mountains and a city grand prix, the three-day event provides a festival of motoring for drivers and spectators. In addition to a number of Porsche 356 cars, one of which will be driven by Dr. Wolfgang Porsche, a 911 2.2 Targa will also compete. The visitors will have the chance to admire the skills of former racing drivers such as Walter Rohrl in a 718 WRS, Jacky Ickx in the legendary 550 A Spyder and current Porsche works driver Marc Lieb in a GT198 as they take part in the 'Chopard Grand Prix von Grobming'. The Porsche Museum will also be taking its classic cars to the '6th Schloss Bensberg Classic', which takes place around the Grandhotel Schloss Bensberg from 18th to 20th July, and from 14th to 17th August it will be present at the famous 'Pebble Beach Concours d'Elegance' event in California. From the 21st to 24th August the Porsche Museum will then be lining up in the 'Sachsen Classic' in Saxony. In the course of this classic car rally, vehicles including a 356 Speedster, a 911 Targa and a 911 Turbo will cover a course of 610 kilometres from Zwickau to Chemnitz all around the Vogtland region. With its concept of the 'Rolling Museum' Porsche is taking a very special approach. Practically all of the museum exhibits are roadworthy and thus fulfil the original purpose for which they were built: to be driven. And the specialists of the Porsche Museum workshop ensure that both before and during every tour of duty the rolling ambassadors of Porsche history are well prepared and in top fit form for every event. Unlike almost any other motoring museum the Porsche Museum thus stands for variety and vibrancy. Instead of a conventional, static exhibition, as a result of the exhibits being continuously rearranged it offers a constantly changing scene in Zuffenhausen. More details are available online at www.porsche.com/museum. Stuttgart. Tennis star Maria Sharapova sped through her semifinal match at the Porsche Tennis Grand Prix. It took the title holder from Russia just 59 minutes to clinch a place in her third final in succession at the world class Stuttgart tournament by beating Sara Errani (Italy) on Saturday. And speed also played a part in her second appointment of the day as Mark Webber, the former Formula 1 star and new Porsche works driver, took the tennis diva out for a joyride around the surrounding Stuttgart area in Porsche's super sports car, the 918 Spyder. At the invitation of Matthias Muller, Chairman of Porsche AG, the sports-loving Australian visited the WTA tournament in the Porsche Arena where he watched Maria Sharapova's victory live from the side of Centre Court. Please note: the Porsche Tennis Grand Prix, Porsche Team Germany and Porsche Talent Team Germany photo libraries, a part of the Porsche Press Data Bank, are available to all accredited journalists at the internet address http://presse.porsche.de. Stuttgart. Dr. Ing. h.c. F. Porsche AG is celebrating the world premiere of the Boxster GTS and Cayman GTS at Auto China in Beijing. The duo of the most powerful and speedy mid-engine sports cars from Porsche are setting new sporty benchmarks in their segment. Porsche is presenting the two new top models for the first time at its press conference on April 20, 11:30 a.m. local time (5:30 a.m. CEST) in Hall E5, booth 05. Along with the new GTS sports cars, four exclusive new products for the Chinese market are also making their debut. Two new race cars, the 919 Hybrid and the 911 RSR, together with the 918 Spyder Hybrid super sports car round out the sporty showing by Porsche in Beijing. This exceptionally sporty appearance reflects the rapidly growing interest of Chinese customers in high-end sports cars. Porsche has a presence unlike that of any other brand in the still young sports car market in Asia with its extremely appealing two-door luxury segment cars the 911, Boxster and Cayman. China is the second largest single market for Porsche after the USA. In 2013, the sports car manufacturer boosted its sales by 19.9 per cent to a total of 37,425 vehicles delivered. Stuttgart. Sports car manufacturer Porsche will be replacing the engines of all 911 GT3* vehicles of model year 2014. This is the corrective action derived from intensive internal analyses that were initiated in response to two engine fires. Meanwhile, it has been confirmed that engine damage resulted from a loosened screw joint on the connecting rod. The loose connecting rod damaged the crankcase, which in both cases led to leakage of oil which then ignited. After becoming aware of the two cases, Porsche promptly took action to avoid any risk to customers by advising them to cease using the affected 785 vehicles until further notice and have them picked up by a Porsche Centre. Now, engines with optimised screw fittings will be used in all Porsche 911 GT3 vehicles of model year 2014, including in those that have not been delivered yet. The relevant Porsche Centres are in direct communication with customers worldwide to discuss the further course of action. Stuttgart. The sports car producer Porsche is inspecting all engines of 911 GT3 vehicles of model year 2014. Porsche is informing the owners of the affected vehicles directly and recommending that they stop using their vehicles. The company is offering to pick up the vehicles and take them to a Porsche Centre immediately. Safety is a number one priority at Porsche, and the company takes its responsibility seriously. 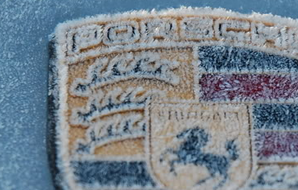 After engine damage occurred in two vehicles in Europe and the vehicles then caught fire, Porsche decided to inspect all 785 delivered vehicles worldwide. There was no traffic accident and no personal injury. Internal studies to determine the cause of the engine damage have not been completed yet. Porsche will report on any new findings immediately. Stuttgart. Porsche is synonymous with sportiness, performance and driving pleasure attributes that apply on two wheels as well as four: Porsche is expanding its Driver's Selection range to include new bikes, available from March 2014. The Porsche Bike RX, Porsche Bike RS and Porsche Bike impress through their use of innovative materials, and deliver a sporty ride both on the road and off it. The design is typically Porsche: The frames of the new bikes are reminiscent of the silhouette cut by the sportscars produced in Zuffenhausen. Featuring a 20 speed gear assembly supplied by Shimano and 27.5 inch wheels, the new Bike RX is the ideal partner for off-road routes. The mountain bike's high-end carbon frame blends stability with a low weight and outstanding damping properties, guaranteeing boundless riding pleasure in the great outdoors. A DT Swiss air suspension fork and hydraulic disc brakes supplied by German brake specialist Magura ensure optimum control for every manoeuvre and on all terrain. The Bike RS also features a high-end frame, with ergonomic components made from carbon, bringing the sport bike's overall weight to just nine kilograms. A 20 speed gear assembly makes the bike ideal for particularly sporty rides through vibrant urban settings or on extended trips. What's more, the XTR equipment provided by Shimano and the ultra-lightweight brakes supplied by Magura ensure complete exclusivity on the road, even without an eight cylinder engine. The Porsche Bike, in turn, features a Shimano Alfine 8-speed hub gear assembly, which permits the eight gears to be shifted with ease. A low-wear geared belt drive transfers the power to the wheels without making a sound, while the MT26 disc brakes provided by Magura ensure optimum safety making the Porsche Bike the ideal companion when navigating through the urban jungle. Another outstanding feature of the Porsche Bikes is the anti theft label, applied as standard under the paint on the frame. The label contains a unique code and is intended to deter thieves. Should a theft nevertheless occur, this code can then be used online to report the bike as stolen. Registered bikes can ultimately be checked by anyone online and while on the move simply by using an iPhone app and QR code, making it considerably more difficult to sell on stolen bikes. The Porsche Bikes will launch on the global markets in three sizes (S, M and L) from March 2014. Details of these and other products in the Porsche Driver's Selection range can be found in Porsche Centres around the world and online at www.porsche.com/shop. Not all products are universally available. Stuttgart. Porsche starts with four cars in the World Endurance Championship (WEC) and the 24 hours of Le Mans. Today, Thursday, the Le Mans organiser, the Automobile Club de l'Ouest (ACO) in Paris, announced the list of competitors selected to participate in the 82nd edition of the classic long-distance race on June 14th and 15th, 2014. Porsche has registered its new works team for the two 919 Hybrid cars as "Porsche Team" in the top category of Le Mans prototypes (LMP1). The start numbers for the innovative hybrid sports cars are 14 and 20. The works team for the two 911 RSR entries in the GTE Pro class is called "Porsche Team Manthey". Last year's double-winners will start again this year with numbers 91 and 92. Porsche works drivers Timo Bernhard (start number 20) and Romain Dumas (start number 14) are each assigned to one of the two Le Mans prototypes in the WEC. This series comprises eight races, including the 24 hours of Le Mans. As a result each of the two 919 Hybrid cars will be piloted by a Le Mans overall winner: Bernhard (Germany, 33) and Dumas (France, 36) both achieved this success with Audi in 2010. There is still no final decision on which of the four other LMP1 Porsche works drivers will take turns at the wheel during the 2014 FIA World Endurance Championship Brendon Hartley (New Zealand, 24), Neel Jani (Switzerland, 30), Marc Lieb (Germany, 33) and Mark Webber (Australia, 37). Team Principal Andreas Seidl explained in Paris: "It was an obvious choice to split these two pilots to the two cars because of their special long-distance and Le Mans experience. The confirmation of our entry is another milestone on our road to Le Mans. We are all excited to meet our competitors for the first time at the official test at Paul Ricard at the end of March and of course at the WEC season kick-off at Silverstone in April." The 919 Hybrid was developed to meet the new efficiency regulations for the top category of Le Mans prototypes. The 919 Hybrid has a highly complex hybrid drive system comprising a small-capacity supercharged V4 combustion engine, an electric motor driving the front wheels and two energy recovery systems. In the GTE Pro category, Porsche is again putting forward the Porsche Team Manthey with two 911 RSR cars against the works teams of Aston Martin, Corvette, Ferrari and SRT Viper. Many details on the GT sports car from Weissach were revamped for the last race in the 2013 season. The modified aerodynamics of the front end, a wider rear wing and adapted chassis kinematics ensure enhanced balance and improved controllability at its handling limits. "In the 2013 season, the 911 RSR gave impressive proof of its long-distance capabilities by its double victory at Le Mans," said Head of Porsche Motorsport Hartmut Kristen. "At the 24 hour race in Daytona, we again celebrated a win in a classic long-distance race with the revised version of the 911 RSR, this is certainly a good omen for Le Mans 2014." We will update the Porsche Press Release ara of the Folio s more Press Announcements are made by POrsche, so be sure to check back often. As always, if there's something missing that you feel needs to be included or if something doesn't seem quite right, then please let us know. Just click on "Contact us" at the bottom of the page. We hope you enjoy the Porsche Press Release area of the Porsche Folio!